1. Heat oven to 200°C/180°C fan/gas 6. Put the bulgur wheat in a large bowl, then cover with 1 litre/1¾ pints boiling water. Cover with cling film and allow to stand for 30 minutes. Meanwhile, put the fennel in a large roasting tin, drizzle with the olive oil and season. Add the orange zest and half the orange juice, and roast in the oven for 35 minutes until softened and slightly charred. 2. Drain the bulgur wheat, add the parsley and mint and remaining orange juice. Combine well and season to taste. 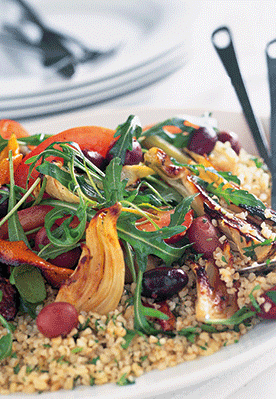 Put the tomatoes, olives and rocket in a large bowl, add the roasted fennel with the pan juices and toss well. 3. Divide the bulgur wheat among four serving plates, top with the fennel and tomato mixture and serve.